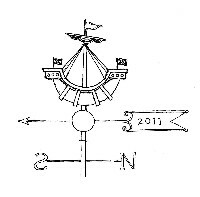 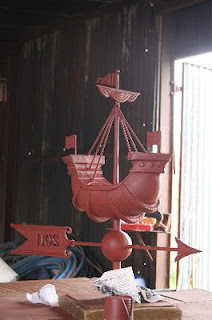 I have worked on a fair few boats in my days as a weathervane maker. 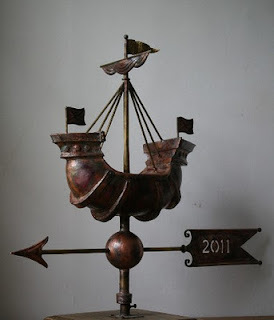 Boats are the second most popular theme amongst historic 3D vanes in England, so there is plenty of inspiration pieces. 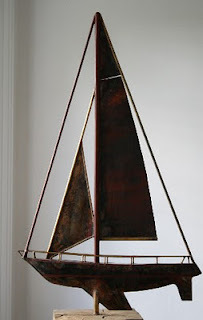 Usually it is the ornate detail, the rigging & abundance of sail that makes a showstopping boat, and usually it helps if the design is based on a famous and beautiful ship in the first place! The boat currently on the workbench will face similar weather, being destined for one of the islands in the Inner Hebrides in Scotland . Here are some snaps of the design being developed. 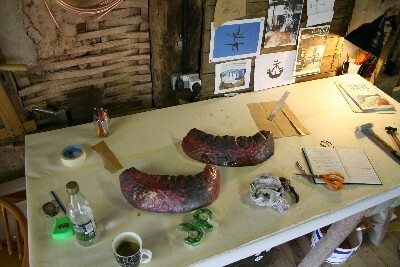 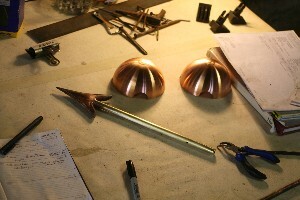 The final image shows the "lymphad" with a red undercoat, in preparation for full gilding.